Excellent decals & sticker finds. When considering custom dirtbike graphics there a numerous places to go. You may want a certain look or feel for your bike, or you may want graphics that go with your dirtbike clothing. If so you may want to buy the apparel first to make sure colours and images match up ok.
Also consider private sellers who have bought custom dirtbike graphics by mistake, you could pick up a bargain from the internet quite easily. However if its your intention to have a full custom job, you can take it to your local dirtbike store and have it professionally fitted too. There would be nothing worse having paid for new graphics and once applied it has bubbles, or dirt underneath them, you would be better to pay a little extra to do a quality job. Your custom dirtbike graphics will complete the pitbike, better than you ever thought possible. You want to make your bike the nutz, so you'll need custom dirt bike graphics. We had a browse online to see where some of the best MX bike "dirt" graphic kits are for your dirt bike plastics. Now remember the more unique the MX bike dirt sticker is, the more you will pay! 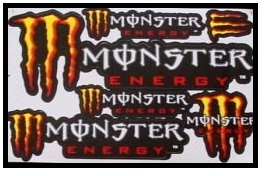 Some dirt bike decals can be bought as a full racing kit, while other graphics / dirt bike stickers are simple one-off items. With all of the stores below, they should cater for all the new dirt bikes and older 2007 dirt bikes on sale today. So if you have a kawasaki dirt bike or require decals for your new yamaha dirt bikes you should be well catered for, but always double check with the seller before parting with cash - nothing could be worse than buying a fantastic Honda dirt bike sticker and getting it home to realize it doesn’t fit ! 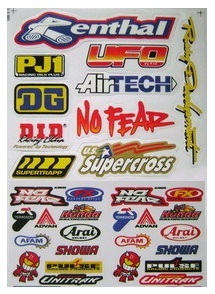 Our first online store we checked out is xgxracing.com; which offer some vibrant dirt bike graphic kits. They are digitally printed to a high resolution. Offerings include fender, swingarm, tank & shroud, fork guard and number plate graphics, and there appears to be a big release of dirt bike sticker options for next year. The site isn’t bad to navigate and we were impressed with the look and feel of the store. Next along is shockwavesigns.com.au. Superb for custom dirtbike graphics as they custom make all pitbike graphics and numbers, using a 3M high bond material plus laminate over this to stop stone chips. We could not see specific prices, but this will be due to each individual’s requirements and you can email the store owner your questions. Shockwavesigns have for sale race number decal sets, rear guard and custom designed back plate kits too. Examples look impressive and practical. The next site on our list for custom dirtbike graphics was brmoffroad.com. The bike custom dirt graphic sets are printed on a high durable plastic and are laminated. 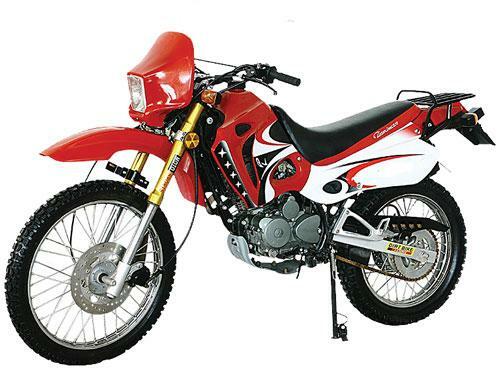 The site list's all the main popular dirt bikes of today, so you’re sure to find something for your individual motocross dirt bike. The sets are printed at 1400dpi for high resolution, and we were also impressed that they offer the choice of a single replacement sticker as well as full dirt bike kits. This is sure to keep your costs down. With lots of designs, colours and dirt bike sticker sets contour cut to fit your motocross bike "dirt" plastic exactly, they should be on your shortlist. 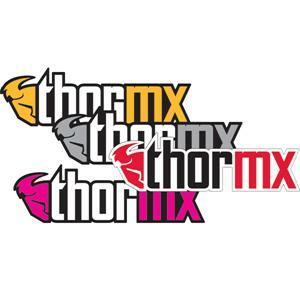 Another neat little site was fourthfloorgraphics.com which has an MX Bike Graphics page. Your motocross decal kits are printed on high quality vinyl with high quality adhesive. One example we checked out was an item called “Hell Ghast" selling for a price of $69.95 + tax. 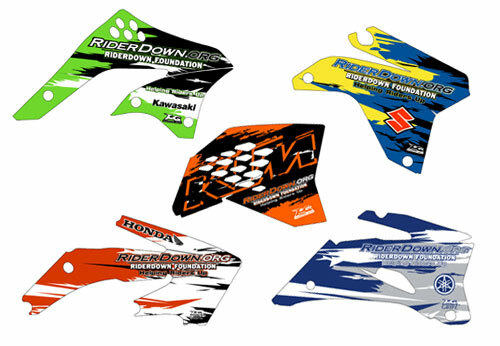 There was lots of other custom dirtbike graphics kits on this site too, and apart from double checking with the store that there graphics will fit your own bike, we found them colourful and sure to draw attention on the dirtbike track. Speedgraffix.com too offers truly customizable graphics, with prices ranging from $99.99 for smaller bikes to $149.99 for larger bikes. To have your graphics designed prices start at $75 per hour including revisions. When ordering things like this you’re best being very specific on your make and model of bike, even a simple drawing will stop confusion. Be as detailed as you can, and it will be a breeze for your designer. So anything can be designed from a MX bike (dirt) red skull sticker, to a yamaha swingarm decal, what would you love on your bike? We hope our rundown has helped in finding your way through the maze of stores out there. Going for a dirt bike decal kit can improve any motocross bike. A MX bike decal "dirt" kit comes in any colour you could want; even specialist ones such as graphic sets for Honda dirt bikes models. But you don’t have to buy branded ones; MX bike dirt graphic kits are many and varied, but do check they will fit your pitbike before ordering. Custom dirtbike graphics are an amazing addition to any bike or quad & add value.